UFOs sighted over Bilston was the message being visually displayed as the multi-media screens blinked into life and the house lights dimmed………OMG………Were we about to be transported off on an ethereal technicolour voyage? Well with some appropriately chosen warm up music from the likes of Star Trek, Thunderbirds and the X Files along with the sight of an aliens head on the stage it kind of indicated that RPWL were in town tonight to regale us with some cosmic stories from their latest album ‘Tales From Outer Space’. With the presence of some shadowy figures on stage the opening video segment of the first track ‘A New World’ is projected onto the screens at the rear as founding member Yogi Lang (vocals) strolls onstage turns to the audience and proceeds to click a handheld device which briefly creates a white wall of cascading light across the venue to simulate the arrival of the aforementioned UFOs. As the band launch full steam into the well chosen opener, which is driven and punchy with some strategically placed rocky riffs, we are off to infinity and beyond. 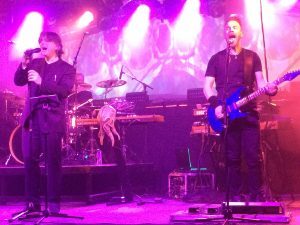 Starting life in their home land of Germany, as a Pink Floyd tribute band back in 1997, they have subsequently developed their own style of progressive rock music which is very much inspired by their heroes. Anyone expecting a fragile and delicate evening of music would have been in for a shock as they bravely took the gamble to play the new album in its entirety, which included the atmospheric and mesmerising delivery of tracks such as ‘Welcome to the Freak Show’ and ‘Give Birth to the Sun’. Described as seven episodes beyond belief the album is built around the common denominator of science fiction and to their obvious delight has given them their highest ever chart entry at number 49 in Germany. Each story was told vividly courtesy of the synchronised media display which allowed the audience to imbue themselves with a picture of the music with consummate ease. To complement this serious kudos should be given to the guy on the mixing desk who delivered a delicious spectral quality to the sound. There were no airs or graces from the band as they enlightened the audience with a spectacular ‘Light of the World’ turning the minor musical epic into something significant and very clever. Midway through the number the tempo slowed as the music started to transport us through the galaxy with some simplistic yet highly effective and pristine keyboard playing from Markus Jehle. The guitar playing of Kalle Wallner is central to the band’s sound and forms a major keystone to their appeal. With the obvious comparisons to Dave Gilmour his fingertips expelled as pure a sound as could be hoped for all evening. On numbers like ‘Far Away From Home’ he was wringing every last note of feeling and emotion from his guitar showing that playing live is what it’s all about. Marc Turiaux provided the understated rhythmic ebb and flow on the drums alongside bass player Sebastian Harnack who, having being borrowed from Sylvan for the tour, had the audience equally engaged as he etched out numerous effective notes adding a dynamic focal point to the heart of each track. It was with an almost sense of relief that Yogi Lang thanked all for listening to the ‘Tales From Outer Space’. 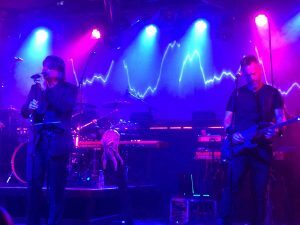 This was possibly only the second time they had played the album live and the energy sapping performance showed that they are willing to take a risk which certainly paid off. Now it was time to step back into some more familiar territory with the soaring guitar of Wallner on ‘Hole In the Sky’ and crowd favourite ‘Roses’ which received the loudest cheer of the evening. Proceedings were rounded off with ‘Unchain the Earth (The Scientist)’ from ‘Beyond Man and Time’ a kind of subliminal tribute to Pink Floyd with its powerful enchanting symphony of guitar and keyboards. One word could be used to describe tonight and that is ‘tremendous’. The only minor flaw was that the backing tapes started while Lang was still talking on a couple of the latter tracks but putting that aside the healthy sized crowd had been enthralled throughout. By playing an album in its entirety it lets the fans hear songs they wouldn’t normally get to witness up close and personal. Let’s hope that one day ‘Tales From Outer Space’ will get dusted off once again for a live showcase.